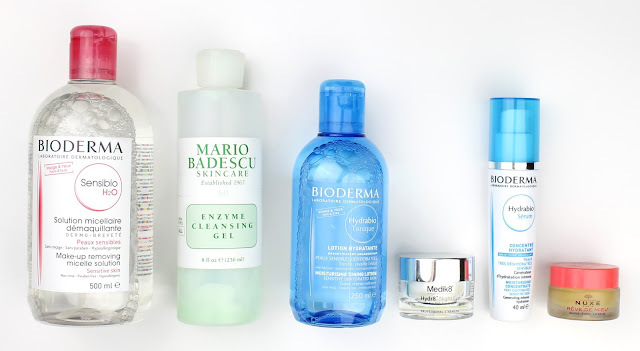 I just realised that it has been ages since I posted an update of my skincare routine. 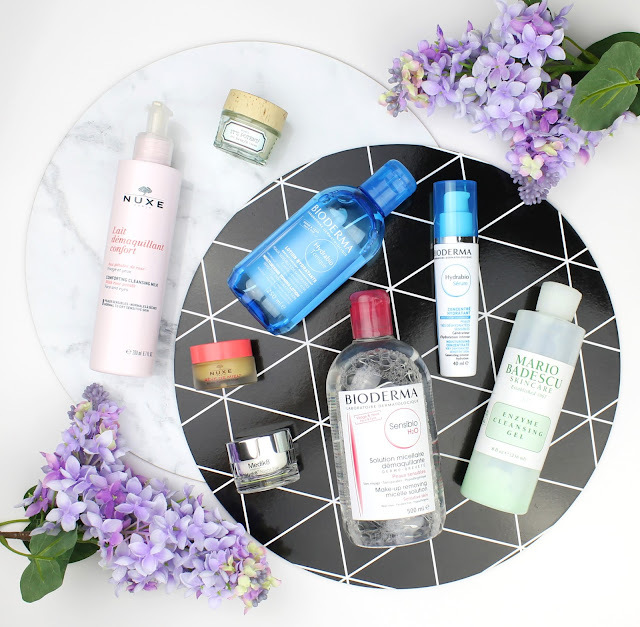 As a beauty blogger I try a lot of skincare but my skin really started to hate me for it so I have gone back to some of my old favourites. I have chronically dry skin that can be a little sensitive at times so I have really been gravitating towards higher quality simple products to settle my skin down. Nuxe Rose Petal Lait Démaquillant Confort Comfort Cleansing Milk $26.99 - I really love this one because it cleanses my skin without stripping it at all. It actually leaves my skin more moisturised. It is also really convenient because I can sit down at my desk and do my entire morning skincare and makeup routine without ever needing to use a sink. If you were worried that a cleansing milk won't get the job done, don't be; this one picks up makeup and dirt that my cream cleanser wash misses. Bioderma Hydrabio Tonique Lotion Hydratante Moisturising Toning Lotion $31.99 - I actually slightly prefer the Nuxe Rose Petal Gentle Toning Lotion ($26.99) but unfortunately Priceline doesn't seem to stock it anymore and I haven't gotten around to placing an online order. This toner is a worthy substitute though and it always leaves my skin toned, refreshed and moisturised while removing any residue left over from my cleansing milk. Benefit It's Potent Eye Cream $59 - I am now onto my second tub of this eye cream and I am still loving it. It is a beautiful light formula that leaves my under eye area moisturised and refreshed. It also works wonderfully underneath makeup to ensure my concealer looks flawless. Bioderma Hydrobio Sérum Concentré Moisturising Concentrate $45.99 - I am onto my third bottle of this amazing serum. It is a really light but intensely hydrating lotion that absorbs so quickly and sits really well beneath makeup. I usually use this on its own but I am keen to try the Rich and Light creams from the same range because this one is fantastic. Mecca To Save Face SPF 50+ Superscreen $40 - I recently received this as my Mecca Beauty Loop birthday present and it has totally replaced all my other sunscreens. It is non-greasy, lightweight, pleasant smelling and sits beautifully one the skin and beneath makeup. It is hands down the best sunscreen I have ever tried. Bioderma Sensibio Solution Micellaire Démaquillante Make-up Removing Micelle Solution $42.99 - I always use this to remove my makeup at the end of each day. I honestly can't even remember what number bottle I am up to because I have been using it for years. I have tried the other cheaper micellar waters but they are never as good and always irritate my eyes. It is the one skincare product I will never be without. Mario Badescu Enzyme Cleansing Gel $20 - This is my second bottle of this and I love it because it is simple, effective and never irritates my skin. I also find that it helps to reduce dullness and never leaves my skin tight and stripped. Medik8 Hydr8 Night Eye Vitamin Rich Eye Cream $89 - With Vitamin A Retinol to prevent aging and maintain moisture, this is an intensely rich moisturising eye cream that has really helped to brighten up my under eye area. Nuxe Rêve De Miel Baume Lèvres Lip Balm $19.99 - This is by far my favourite lip balm and I have been using it every night for at least a year. It always brings my lips back from the brink even in the middle of winter when they are horribly chapped. It has lasted me ages as well which makes this glorious little tub a worthy investment. So there you have my updated skincare routine. I have been so happy with all of these lately and my skin has settled down so much now that I have stopped trying a million different things. It means I won't be able to review as much skincare but its worth it because I was getting some pretty frustrating breakouts before and now my skin is perfect. I would love to know what skincare products you have been loving or if you love any of these as much as me so let me know in the comments below. 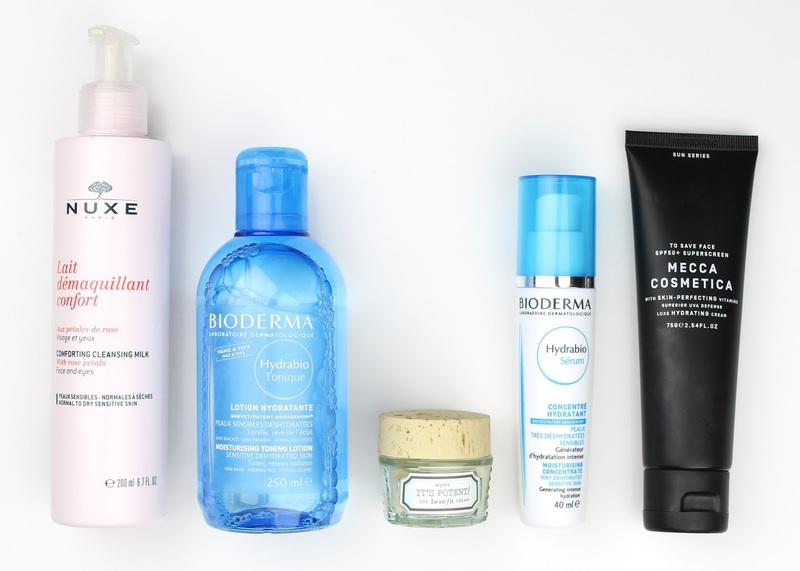 2 comments on "My Current Skincare Routine"
I have just started using the Bioderma Hydrabio serum (that we got in our BUA bags) and it is so nice! I thought it would be too much for my combo skin but I just concentrate it on my cheeks and then spread it around! It feels so silky on your skin!! I'm loving that serum as well! Bio arms have sent me a few other things recently but I'll need to wait until the next Priceline sale to replace it soon.